Water splitting with solar energy could provide an efficient route for large scale renewable energy conversion and storage. 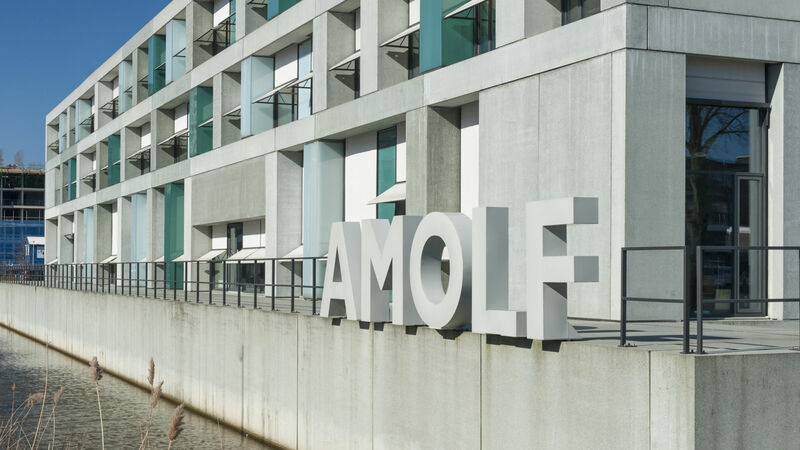 Scientists from TU Delft and AMOLF have now engineered a very efficient and stable photoelectrode, a material that absorbs light and directly splits water into hydrogen and oxygen. Furthermore, they use silicon wafers as the light absorbing material, so the system is also cheap. They report on their findings in Nature Communications on Thursday, June 29th. 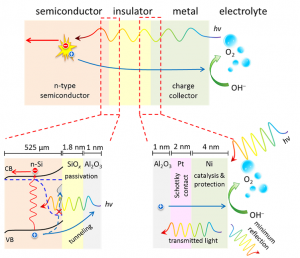 Photoelectrochemical (PEC) water splitting (into hydrogen and oxygen) is seen as a sustainable approach to produce clean and renewable fuel by the direct conversion of solar to chemical energy. The hydrogen could, for instance, be used directly in fuel cells or combined with other molecules to create sustainable chemicals. ‘So, in summary, we now have a material that is low cost, absorbs a lot of light, has a high catalytic efficiency, and is remarkably stable’. It is essential for a PEC-system to provide a sufficiently high photocurrent and photovoltage to drive the water oxidation reaction. Typically there is a balance between the catalytic efficiency of this system and its long-term stability. Fixing one problem usually makes the other worse. ‘Here, we have independently addressed the stability and catalysis bottlenecks in photoelectrochemical water splitting, and combined them into one simple system. We used a newly designed insulator layer to stabilize the semiconductor (Si) photoelectrode, while also using two metals to increase photovoltage and split water with a high efficiency. This approach, known as making a metal-insulator-semiconductor (MIS) junction, has proven efficient previously but never as durable’, Smith explains. ‘Despite the great advantage of the MIS structure for solar water splitting, there remains a major trade-off between the high efficiency and the long-term durability’, says Smith. Therefore, many efforts have concentrated on protecting the photoelectrodes. Nickel (Ni) is an attractive metal that has all the functionalities required for MIS photoanodes: a high work function for high photovoltage generation, an active catalyst for water oxidation, and high chemical stability in strongly alkaline solution. Ni absorbs light, which can limit the photoelectrode performance, so it must be made very thin (2 nm). However, such a thin Ni layer is not able to completely protect the underlying photoanode in a highly corrosive electrolyte at pH 14. The researchers have now developed a MIS photoanode that can yield a high efficiency and high stability by engineering both the metal-insulator and insulator-semiconductor interfaces. Specifically, they have introduced a Al2O3 layer and two metals, Pt and Ni. Using this simple yet effective protection strategy, they obtain more than 200 hour operation of a MIS photoanode that shows constant high photocurrents in a strong basic solution. Thus, the approach used in this study can potentially be integrated into existing PV technology, making it promising for future applications. To successfully realise spontaneous water splitting, the photoanode should be combined with larger band gap photoelectrodes in a series or tandem arrangement. This would simplify the design of a highly efficient photoelectrochemical device for solar water splitting.